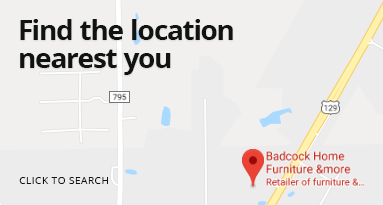 Here at Badcock Home Furniture &more in Waynesville, North Carolina, we provide our customers with quality furniture and appliances they will love. We believe that everyone deserves to have beautiful furniture and modern appliances, so we offer easy financing and payment plans that work with your budget. Our store is at 356 North Main St. Waynesville, North Carolina 28786, you'll see our charming store located just north of the Main Street shopping area, next to BB&T Bank. We are open Monday through Friday from 9:00 a.m.-7:00 p.m., Saturday from 9:00 a.m.-6:00 p.m., and Sunday 1-6:00 p.m. If you have any questions or would like more information, you can call us during our store hours at (828) 452-1522.